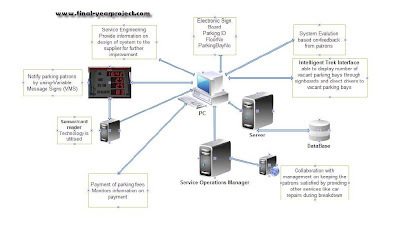 This is a good Computer Science project report on Parking Management System using Service Science Management and Engineering (SSME) Approach and submitted in partial fulfillment of the requirement for the degree of Master of Computer Science. The focus of this research is incorporating the SSME concept by integrating important components of business, management and technologies, in order to provide quality parking services for customers and thereby improve the management of parking systems. You can also Subscribe to FINAL YEAR PROJECT'S by Email for more such projects and seminar. The primary goal of this study is to improve the current car parking service system and this is carried out through service innovation which is inherently multidisciplinary. This study used a various data collection such as questionnaire and survey to find out the problems faced by parking patrons. The objectives of this research are to formulate an architecture for a car parking management system using SSME approach, to determine the current parking management system problems and how it is related to poor system development with reference to SSME. Thanks to the author for the project. Use it for your reference and study work.